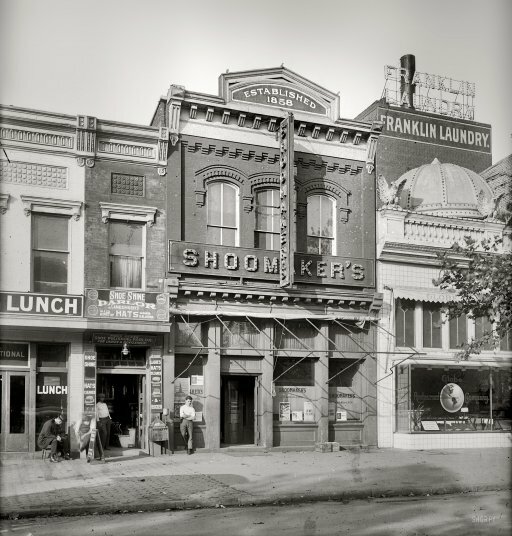 Rickey and his bartender – George A. Williamson – created the drink in 1883 at Shoomaker’s by combining Rickey’s favorite bourbon and mineral water with the juice of half a lime. Nothing too complicated, but it seems to have caught on, and soon Washingtonians throughout the city were throwing back Rickeys. The drink became even more popular with gin, which is how you’ll find it in most bars today. Shoomaker’s was an iconic and divey spot, located on E Street off of Pennsylvania Avenue, which was nicknamed “Rum Row.” The Row was a boozy mixture of journalists (whose bureaus were right around the corner), lobbyists, and politicians, conveniently located between the White House and the Capitol – perfect for a 19th Century bar crawl. Unfortunately for us, Rum Row is no longer. The saloons were decimated by Prohibition, which went into effect in D.C. on November 1, 1917 – two years earlier than the rest of the country. Shoomaker’s stayed open serving until the last drop and the last minute at midnight, and then converted to a soft drink establishment. That only lasted a few months. The bars along Rum Row were all torn down for redevelopment, but you can visit the site of Shoomaker’s at the J.W. Marriott Hotel. There’s a plaque commemorating the birthplace of the Rickey, and you can sample one in the 1331 Bar and Lounge. D.C. writer and mixologist Derek Brown and author Garrett Peck did their own bit of lobbying for the plaque, and to have the Rickey declared D.C.’s native cocktail in 2011. And each year the D.C. Craft Bartender’s Guild sponsors a local Rickey contest to celebrate some creative takes on this most traditional of cocktails. This year’s competition is being held today at Jack Rose Saloon in Adams Morgan – I’ll be sampling the eight different entries, and posting photos afterward. I’m particularly looking forward to trying the Rick Rolled Rickshaw from Rachel Sergi, mixologist at Union Market’s Buffalo & Bergen. So next time you find yourself in a Washington bar, try ordering a Rickey. Chances are the bartenders will put a bit of their own personality into it. Seek out one of Derek Brown’s bars, The Gibson, The Passenger, or The Columbia Room – or do try this at home!